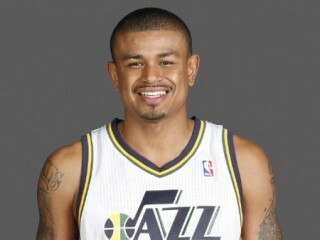 Earl Watson is a Mexican-American professional basketball player who currently plays in the National Basketball Association (NBA) for the Utah Jazz. Watson is a graduate of Washington High School in Kansas City, Kansas. In his senior year of high school he averaged 23.4 points, 8.3 assists and 13.2 rebounds per game. The Pacers leader in both assists and steals, he ranked among the NBA's top 40 in both categories…he established a career-high with 104 steals and had at least one theft in 23 of the team's final 25 games…in that 25-game span, he averaged 1.72 spg and his 1.32 spg average for the season was 27th best in the NBA…he had a streak of 12 straight games with at least five assists snapped by a four-assists outing against Orlando, 4/12, and he totaled seven in the season's final two games…though he fell one short of reaching 400 assists for the fourth time in his nine-year career, he ranked 23rd in the NBA with an average of 5.1 apg…he had 10 or more assists eight times and was the only Indiana player with 10+ assists in more than one game…six of his outings with double-digit assists came in the season's final 23 games and he averaged nearly six and a half assists a game (6.4 apg) in that stretch…he had a season-high 13 assists on two occasions and recorded two double-doubles…the team leader with a steals-to-turnover ratio of 2.28:1, he ranked 39th in the league in this department…the second of his three steals in the Pacers' win over Utah, 3/26, was the 700th of his career and he had multiple thefts in 15 of the last 30 games…in that 30-game span, he averaged 1.6 spg, compared to 1.14 spg in his first 49 appearances…in the last 30 games he had three or more steals seven times, as opposed to eight times in his first 49 outings…he claimed a career-high tying six steals at Orlando, 1/20, and that was the only game in which a Pacers' player had more than four thefts in 2009-10…his 7.8 ppg ranked fourth-highest among his nine NBA seasons and he scored a season-high 20 points in his Pacers regular season debut in Atlanta, 10/28…in all, he scored in double figures 27 times, including five of the last eight games…in the final eight contests, he averaged 10.1 ppg and recorded 16 points at Cleveland, 4/9, which was his highest total after scoring 18 points at Boston, 12/22…hitting 50+ 3-pt field goals for the first time in three seasons, and the fourth time in nine NBA campaigns, his 53 3-pt field goals in 2009-10 featured a season-high three on four occasions…he shot 26-75 (.349) from 3-pt range in his first 29 games, but then was just 27-109 (.247) in his last 50…including a career-high tying 10 rebounds vs. Memphis, 12/30, he averaged a career-high 3.0 rpg in 2009-10…he had at least five rebounds 14 times, including eight of his first 45 appearances…his 10 boards against the Grizzlies featured five offensive rebounds, his most ever in the NBA…that was one of three games in 2009-10 in which he had more than two offensive boards…he gathered three boards at the offensive end vs. Golden State, 11/11, and vs. Milwaukee, 2/25…rejecting 15+ shots in a season for the fourth time in his career, and the first time in the last three campaigns, he had 16 blocked shots in 2009-10…he rejected two shots four times, accounting for half his total on the season…he made his first start of the season in the Pacers' win over Boston, 11/14, but then wouldn't make another start for a month...he made his second start of the campaign at San Antonio, 12/19, and that would be the first of 51 starts in his last 56 appearances…as a starter, he averaged 8.0 ppg, 5.8 apg, 3.1 rpg and 1.3 spg…in 27 games off the bench, he averaged 7.4 ppg, 3.6 apg, 3.0 rpg and 1.3 spg…he spent three games on the Pacers' inactive list: one in December (12/9) for a sore left hamstring and two in February (2/5-6) for personal reasons. 10-plus points 13 times, including four of the last five games played…10 or more assists eight times….Two double-doubles…Led Thunder in assists 36 times…Recorded double-double 16 points and 14 assists at LAC (4/15)…At POR (4/13), Watson led OKC in scoring for the first time this season…In 26 min, scored 16 points on 6-of-10 shooting… Averaged 13.9 points in a four-game strectch from 3/8-3/11. Started and played in 129 games, breaking UCLA's record for career starts (127) previously held by Don MacLean (1989-92). Tied for second on the career games played list (129). Ranked first on UCLA's career steals list (235), fourth in assists (607) and fourth in three-point field goals (133). Second player in school history to record 600 assists and 200 steals (Tyus Edney). Fourth player in Pac-10 history to make the career top 10 in both assists and steals. As a senior, ranked second on the team in scoring (14.7 ppg) and field goal percentage (.493), and first in assists (5.2 apg) and steals (1.9 spg). Named All-Pac-10 by the league's coaches and was selected first-team All-District 15 by the NABC. Scored in double figures 26 times and recorded eight 20+ point performances. Averaged a team-high 16 points, 5.7 rebounds, five assists and two steals in three NCAA Tournament games. Scored a career-high 30 points vs. North Carolina. As a junior, averaged 11.4 points, 5.9 assists and 3.9 rebounds.